We are a small family Hostel where you can feel just like at home. 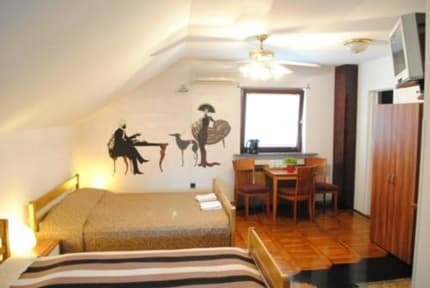 Cherry is located in the heart of Zagreb, 15 minutes walk away from the main square. 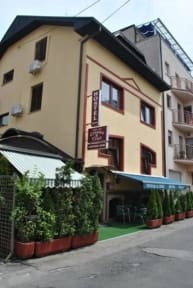 The building is brand new and fully equipped, situated in a quiet street only 2 minutes walk from the tram. We offer you free home-baked breakfast, free Wi-Fi ,spacious rooms with funky hand painted walls, a luxurious terrace and free parking. We have a private room as well as dorms with 3, 4 and 6 beds. Linen, blankets and towels included. If you want to hang out outside your room you can snuggle in our common/tv room, or read a book at our cozy and luxurious terrace where you can meet other travellers. You can relax in our Café bar known for it’s beautiful interior coated in leather, wood and marble, where you can enjoy our delicious coffee. If you are not a coffee fan, you can try our local beer and spirits (rakija). Only a few minutes walk from the hostel you can find grocery stores,an open food market,kiosks, ATMs, restaurants. Hostel is super. The staff is very kind. Super recomended.